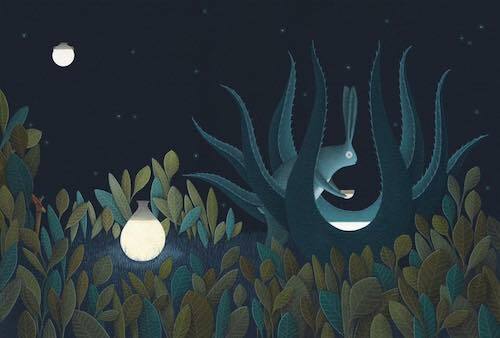 Artist David Álvarez’s illustrates Noche Antigua (Ancient Night) in which an opossum and a rabbit work together—and against each other—to create and maintain the sun and the moon. The book is based on elements from ancient myths in several Central American cultures. Álvarez captures a sense of quiet magic with the simplified forms and hushed tones of his illustrations, which seem to glow from the illumination of the moon. You can see more of the artist’s work on Instagram and his Etsy shop, and find a hardcover copy of Noche Antigua on Amazon.